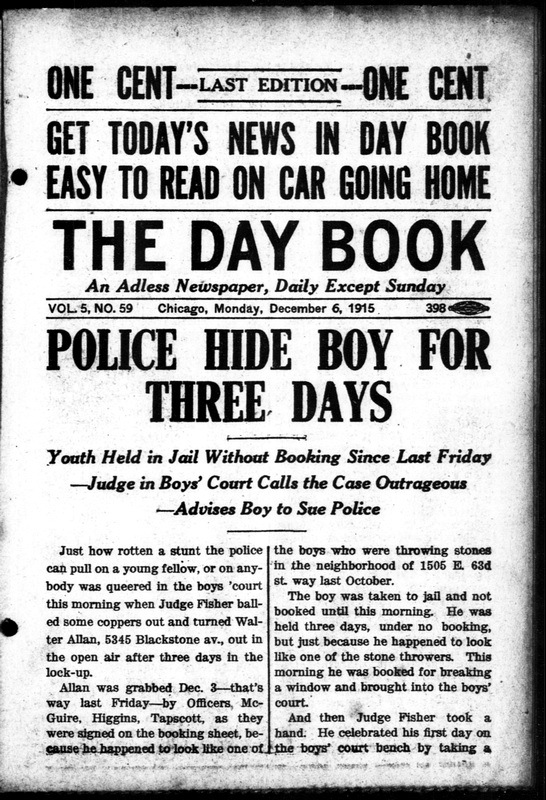 The Day Book was an experimental, advertising-free daily newspaper published in Chicago from 1911 to 1917. It was owned by E. W. Scripps as part of the Scripps-McRae League of Newspapers (later Scripps-Howard Newspapers). With the Day Book, Scripps sought to eliminate the often adversarial relationship between his editorial staffs and the advertisers that sustained them. To his disappointment, pressure from the business community had at times forced the Cincinnati Post to temper its firebrand campaigns against bossism and cronyism. The Day Book began publishing on September 28, 1911. Like his other penny presses, the Day Book championed labor rights while delivering a mix of politics and lowbrow, sensational content. 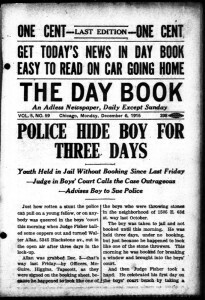 Just how rotten a stunt the police can pull on a young fellow, or on anybody was queried in the boys ‘court this morning when Judge Fisher balled some coppers out and turned Walter Allan, 5345 Blackstone Ave., out in the open air after three days in the lock-up. Allan was grabbed Dec. 3 that’s way last Friday by Officers, McGuire, Higgins, Tapscott, as they were signed on the booking sheet, because he happened to look like one of the boys who were throwing stones in the neighborhood of 1505 B. 63rd St. way last October. good hard, and direct, wallop at the methods of the police. “If such a case as this comes into this court again while I am here I will send for the officers and the captain of the district -to explain things,” Fisher said. Fisher then advised the boy to sue the city and the officers and turned him loose. B. Simon, store owner, who had complained of the stone throwing, absolutely failed to identify Allan as one of the boys. A few weeks later The Day Book provided this update to Judge Fisher’s activity on the bench. The police seem to be getting a better understanding of the general fitness of things in making arrests of boys. 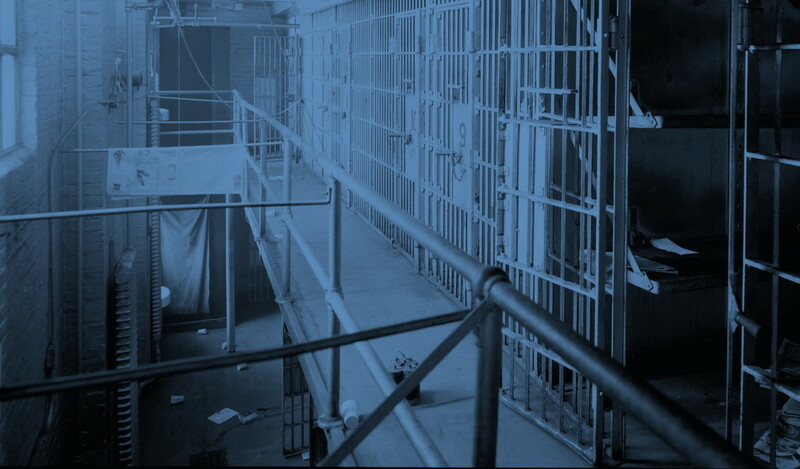 Recently there have been so few of the senseless arrests that were so common in the past that Judge Fisher has made comment upon the matter from the boys’ court bench. “The police are giving the court better co-operation,” said Judge Fisher. “There have been fewer senseless arrests. Recently there have been no lads put under arrest and hauled before this bench because, they whistled too loud or did some thing equally as harmless if boyish.” Judge Fisher a short time ago twice from the bench “climbed the collar” of police who put in jail youths who had done nothing but some boyish prank that could in no manner be construed as a violation of the law. Judge Fisher made his remarks on the police after the preliminary hearing of the four boys charged with holding up Walter Schroeder, 1061 Spaulding Ave, and four others. The four boys concerned are all out on bonds ranging from $2,000 to $5,000. They are: Frank Slitinsky, 16, 2149 W. 18th; Andrew Jarnecki, 23, 2313 W. 18th; Frank Walczak, 18, 2115 W. 18th; Michael Adams, 18, S. Leavitt and W. 21st.